Oklahoma Bureau of Narcotics and Dangerous Drugs. 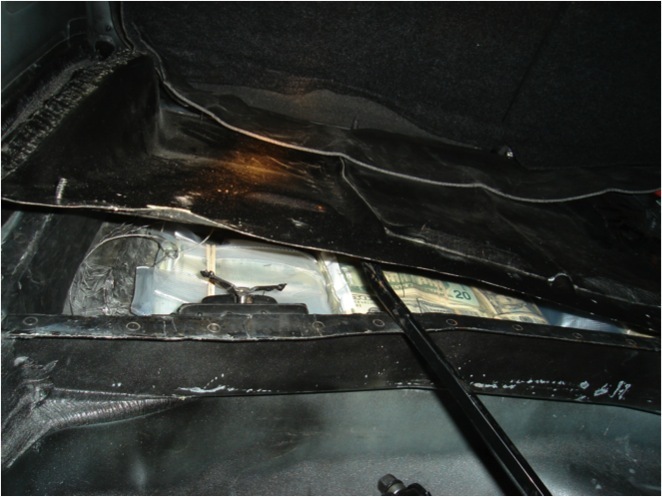 The Oklahoma Bureau of Narcotics and Dangerous Drugs uses this image as an example of money the agency found hidden in the panel of a car and seized. A contentious hearing held Wednesday at the State Capitol provided hints that civil asset forfeiture will again be a hot topic during next year’s legislative session. Civil liberty groups and law enforcement representatives debated for three hours on whether Oklahoma should continue to allow police to seize people’s cash or property without securing a criminal conviction. But after the interim-study hearing, two prominent backers of overhauling the state’s civil asset forfeiture laws said they are unlikely to pursue legislation to end the practice. Instead, Rep. Cory Williams, D-Stillwater, and Sen. Kyle Loveless, R-Oklahoma City, said they are considering a proposal to make smaller-scale changes to the laws. That could include making the forfeiture process more transparent and requiring that proceeds be shared among law enforcement agencies, not just kept by the one making the seizure. In recent years, a growing number of states have ended their civil asset forfeiture practices or have passed laws to make it harder for police to seize property. Opponents of forfeiture argue the practice violates constitutional protections and harms those who haven’t committed a crime. Loveless led a charge during the past two years to pass a bill that would have required a criminal conviction for cash or property to be forfeited in most cases. Among other changes, it would have required forfeited money to go to the state’s general fund instead of the agency making the seizure. The legislation failed to make it out of committee during the last session. Loveless, who faces no opposition in the general election, said Wednesday he is in talks with various groups about what legislation he will introduce next year, but it is unlikely to be “broad” as his previous proposal. Loveless and Williams both suggested one of these areas could a bill that would create a searchable public website that would include information about every seizure made by all law enforcement groups in the state. This would help reveal any trends of abuse of the law by authorities. Brady Henderson, legal director of the American Civil Liberties Union of Oklahoma, said during the hearing that increasing transparency is one of the ACLU’s top recommendations. Williams said he is also considering a proposal that would pool all proceeds from seizures and have it go into a special fund to provide grants to law enforcement groups. By not allowing each law enforcement agency making a seizure to keep the proceeds, the incentive to confiscate cash and property unjustly would be reduced. However, law enforcement representatives said Wednesday they would oppose this change. Travis White, general counsel for the Oklahoma Bureau of Narcotics and Dangerous Drugs, said such a law isn’t needed because there has been no evidence of widespread abuse. Due process protections also remain for people whose assets are taken.